By Christina RoseWith only 2 to 5 percent of children currently speaking Lakota, Thomas Short Bull, president of the Oglala Lakota College, said the time has come to raise the alarm. As the day begins at the Lakota Language Immersion School, a young boy passes an abalone bowl of sage to each child sitting on the floor in a circle. 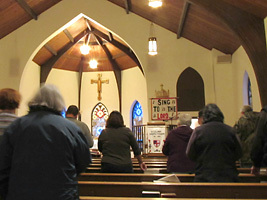 Children from kindergarten through third grade gather for the morning ceremony with prayers, songs, and a short discussion of things to know and remember. The children in the immersion school do everything that children do in school everywhere; they learn math, science, language arts, gym, music, art and more. The difference is that it is all done in the Lakota language. The academic standards are comparable to other schools, but the school has its own curriculum, designed by the Education Department of the Oglala Lakota College. “We are maintaining a compliance with most of the State standards, but as a private school we don't have to,” DuPont said. 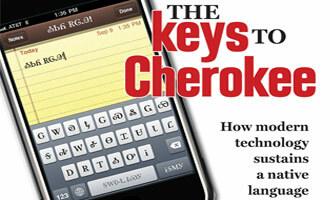 By Stacy PrattHow do you say “texting” in Cherokee? Which letters do you use to spell words in an indigenous language that has never been written? Which words go into a dictionary, and who decides? These were some of the questions discussed in Dr. Pamela Munro’s closing keynote address, “Documenting Native Languages: What Should We Put in the Dictionary?” The presentation was part of the Indigenous Languages Documentation and Revitalization Seminar at the 41st annual Symposium on the American Indian at NSU Friday evening. Munro was in Tahlequah as the guest scholar for the Oklahoma Workshop on Native Languages, which took place Saturday and Sunday. She is a Distinguished Professor of Linguistics at the University of California-San Diego and the co-author, with Catherine Willmond, of the first Chicksaw language textbook, “Let’s Speak Chickasaw: Chikashshanompa’ Kilanompoli’,” winner of the 2010 Leonard Bloomfield Book Award. She has also published dictionaries and grammar books of the Mohave, Cahuilla, Kawaiisu, Wolof and San Lucas Quiavini Zapotec languages, as well as many other articles and books on languages and linguistics.And:Munro’s presentation focused on the preliminary questions that must be answered in the beginning of a dictionary’s creation. Some questions, such as which words should be included, were obvious. Others, such as “What counts as a word?” were puzzles more likely to be enjoyed by linguists than the general dictionary user. But words and spelling are not the only factors involved, Munro said. Human elements also face both writers and users of dictionaries, especially when it comes to dictionaries of indigenous languages spoken by few people. “What about words that some people don’t want to see in the dictionary?” Munro asked. By Susan ShannonDr. Mary Linn is the assistant curator for Native Languages at the Sam Noble Museum of Natural History in Norman, Oklahoma. 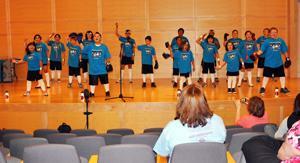 This past week the 11th annual Native American Youth Language Fair took place at the Sam Noble Museum. Dr. Mary Linn has been one of the driving forces behind the Native Youth Language Fair and remembers those early years. “I never dreamed, well I dreamed, I really wanted... I could envision a day when there was so many kids and that they were really using their languages in so many new and creative ways. With an all-time high of 921 registered students coming to the Language Fair, that came out to 446 live performance or submissions of posters, books, comic book, poetry and essays, all using native language, which all had to be viewed either prior to the Fair or at the Fair.Below: "Chickasaw Nation students perform." By Gale FiegeThroughout Western Washington, various tribes are working hard to keep the language alive, especially as the elders die, taking with them a firsthand knowledge of Lushootseed. The women who make up the Tulalip Tribes' Lushootseed Language Department are some of the few who speak it. Natosha Gobin, 32, has been with the department since she was a Marysville Pilchuck High School student volunteering at the tribes' annual summer language camp. She started her seventh annual language class for families in February; the eight-week class ended on Tuesday.